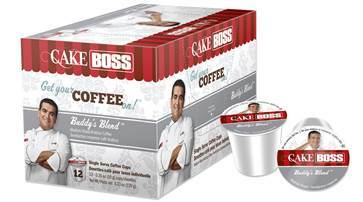 Cake Boss has partnered with Keurig Coffee to bring you a line of single cup coffee cups that combines coffee with delicious dessert flavors inspired by the delicious Italian pastries and cakes seen on the TLC series. Buddy Valastro has infused this rich, smooth coffee with tastes of his favorite bakery creations to create this line of flavored coffee originals that will satisfy your coffee needs and sweet tooth. Buddy’s Blend: This classic Italian Roast features East African coffees that are roasted extra dark to offer intense, bold flavor in a heavy-bodied cup. Chocolate Cannoli: A caffeinated tribute to Buddy’s famous chocolate cannoli— a delectable mingling of creamy custard, chocolate drizzle and hints of buttery pastry. Chocolate Fudge Cake: Fresh, creamy taste and dark cocoa flavors combine to create a deep, delicious chocolaty fudge flavored coffee. Dulce de Leche: A bakery mainstay, Dulce de Leche is rich, creamy caramel flavor kissed with a hint of buttery sweetness. Also available in Decaf. Vanilla Buttercream: Flavors of buttercream frosting and delicate vanilla come to life in this smooth flavored coffee. Hazelnut Biscotti: Fill your cup with the flavor of freshly toasted hazelnuts and the rich, vanilla taste of freshly baked biscotti. Raspberry Truffle: Taste the flavors of fresh raspberries smothered in milk chocolate ganache. Italian Rum Cake: An irresistible flavored coffee inspired by the buttery sweetness and smooth rum syrup of Buddy’s signature sponge cake. The k-cups can be found at the TLC store and will be available at select retail stores later this year. One lucky reader will receive a 24 count box of Buddy’s Blend and a 24 count box of an assorted flavor! Enter the giveaway using the Rafflecopter widget below. U.S. residents only. Giveaway ends on June 27th 2014 12:00 PM ET. Disclaimer: The giveaway is sponsored by Keurig and Cake Boss. All opinions expressed are my own. Sudden Coffee. Not Your Typical Instant Coffee. I am most excited to try Hazelnut Biscotti! I’d love to try the Dulce de Leche because I love caramel flavored coffee. Raspberry Truffle sounds best to me! I’m torn between the Raspberry Truffle and the Italian Rum Cake. I’d really like to try the Dulce de Leche flavor. ◾Vanilla Buttercream sounds good to me. Chocolate Canoli is what I would like to try. I would like to try the Chocolate Fudge Cake flavor. thank you! I am most excited to try the Buddy’s Blend flavor. I would love to try the Vanilla Buttercream. I’m most excited to try the Vanilla Buttercream. The hazelnut biscotti flavor sounds amazing! Raspberry Truffle sounds SOOOO good. I want to try that. I am most excieted to try the Chocolate Fudge Cake flavor. I am most excited to try the Vanilla Buttercream. The ◾Raspberry Truffle sounds yummy. I am excited to try Dulce de Leche. I am most excited to try the Italian Rum Cake. I would really like to try the Chocolate Fudge Cake variety.